Launching into the pocket camera market, JVC has come out with the Picsio – a small camera which captures still images as 8 mega-pixel Jpegs and shoots High-Definition video. This pocket cam beats the camera on most phones in terms of quality of images and video; and its size (same as a small cellphone) makes it easier to carry about compared with standard cameras. The Picsio features image-stabilisation technology minimising camera shake, and has 4X digital zoom. Videos are recorded in the widely-used MPEG-4 AVC/H.264 format and stored as .MOV files for easy sharing reducing the need to convert files. Storage comes on SD/SDHC memory cards. In line with the vogue for intuitive tech, ease-of-use was a top priority in designing PICSIO, JVC claim. Instead of scroll-through menus, functions are selected directly using dedicated buttons. Power (on/off), playback, delete, video/still mode switching, and thumbnail display mode all have their own individual buttons. A four-way controller positioned in the middle controls zoom (by pressing up/down), still image viewing (by pressing left/right), and record start/stop (the center button). The large, two-inch LCD also makes shooting easy. The camera connects to computers with a USB cable and you charge it off the PC as well. Pocket cams are an interesting new market. With the general trend towards portfolio devices like smartphones which meld multiple gadgets in one, it remains to be seen if there’s a market for a single-purpose gadgetry like the Picsio. But the good looks and handy size should tell in its favour. 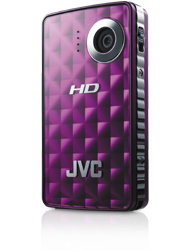 See the specs on the JVC site here. Costs £159 from Play.com available in three colors – Black Ice, Blue Steel and Purple Passion. I got d picsio 4 xmas dis year nd its crap!!! Pic’s turn out BLACK no matter what lighting you have And i took it back to get a new one AND THE NEW ONE WAS WORSE!! !